Chiang Mai University was founded in January 1964, under a Royal Charter granted by His Majesty King Bhumibol Adulyadej. CMU was the first institution of higher education in the north, and the first provincial university in Thailand. Chiang Mai University (CMU) is a public research university in northern Thailand founded in 1964 with a strong emphasis on engineering, science, and agriculture. Its instructional mission includes undergraduate, graduate, professional and continuing education offered through resident instruction. Its main campus lies between Chiang Mai downtown and Doi Suthep in Chiang Mai, Chiang Mai Province. 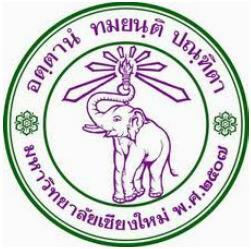 The university was the first institute of higher education in Northern Thailand, and the first provincial university in Thailand. Chiang Mai University is a Leading University with Academic Excellence in International Standards, focusing to become a research-oriented institution of higher education and producing graduates with high moral and ethical standards, equipped to practice good governance under the Sufficiency Economy Philosophy and Sustainable Development. Five-fold Mission addresses the challenges our nation faces amidst a globalizing world. Provide higher education and high level professional education emphasizing academic excellence and quality of graduates with high moral and ethical standards under the Sufficiency Economy Philosophy. Conduct research in various fields to support standards of teaching, learning and technology transfer for the social and economic development of the region and the country. Provide academic services to the national community in line with the Sufficiency Economy Philosophy, particularly for Northern Thailand. Preserve and nurture our religious and cultural heritage, and develop the resources of the unique natural environment of Northern Thailand. Develop the University’s administration systems and management under the Sufficiency Economy Philosophy while aiming at Sustainable Development. There are 20 faculty and 1 college in 3 disciplines. © 2018 Thailand Universities. All Rights Reserved.